Here’s something I’d like to share: Along with my passion for public relations and communications, The PRDude has a passion for a few other things in life. Yes, along with sharing my thoughts about ethical public relations and the value behind the Accreditation in Public Relations credential, there are a few other pursuits that occupy my time. For example, in a post last month, I alluded to my love of gardening. And, I’ve been a dedicated rock and roller and music fan since I received my first guitar some four-plus decades ago. One more thing: I love food. I love to cook. I love to read about food and cooking. And, of course, I love to eat. Over the years, I’ve written a few restaurant reviews, and I keep current on culinary trends. On Friday, I got the opportunity to cook with some real pros. Here’s what happened. My dear Susan slyly tricked me into thinking we were headed to a post-birthday lunch at a hot new downtown Chicago restaurant. The reality: We drove to the northwest suburbs and worked the lunch shift side-by-side with two fine chefs — Michael and Susan Maddox, the husband-and-wife proprietors of one of the areas best and longest-standing French restaurants, LeTiti de Paris. Our day began with a cup of some great coffee — French roast, I believe — and ended with a spectacular meal. Our shift was one of the many cooking classes and demonstrations the chefs host right in their kitchen. This one was was called the Hands-On demonstration, because we pitched in and helped prepare food that would be served to patrons later that day and over the weekend. We broke eggs to make creme anglaise, chopped onions and leeks, measured various sugars for sorbet and ice cream, rolled dough for a cherry tart and various duties. 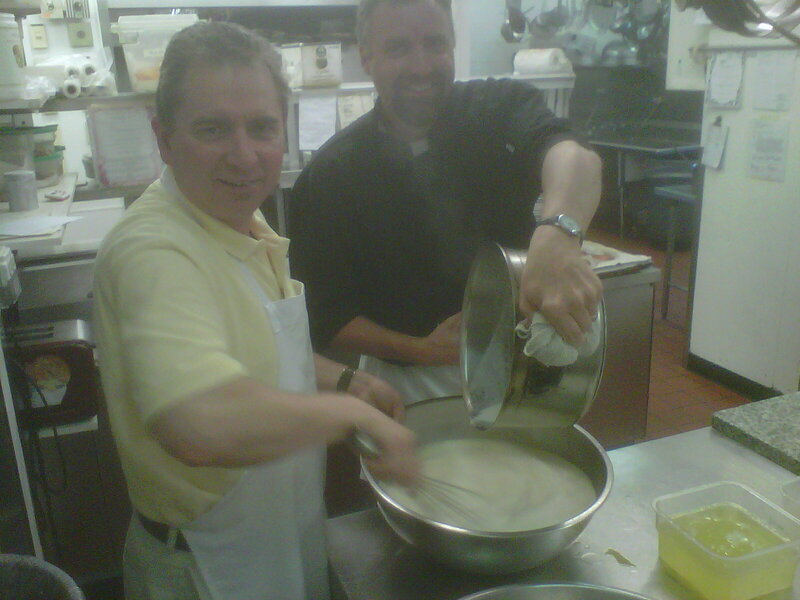 Me and Chef Michael preparing creme anglaise. Checking on the creme brulee. That Old Adage is True. How many times have you heard, “If you can’t stand the heat, get out of the kitchen?” Well, it’s really true. It’s hot in there; really hot. Especially on the line where proteins are grilled, seared and baked before being plated and prepped for the dining room. The stoves and burners in a commercial kitchen throw out a lot more heat than the one you have at home. You Think You Work Hard? The next time you complain about putting in a 10-hour day, talk to a chef. They put in a much longer work day, usually 14 to 16 hours. And that’s five or six days a week, running a business while working under constant pressure to deliver a delicious plate of food. Wonder Why Restaurant Food Tastes So Good? Well, professional chefs are much better in the kitchen than us fledgling food fanatics, they have much better kitchens and they have access to much better proteins, produce, grains and dairy. One more thing: They take the time to do things right. Creating beef stock? It takes roasting 80 or so pounds of bones, then cooking them down in 30 gallons of water until it’s reduced to five gallons. Do you have time for that? 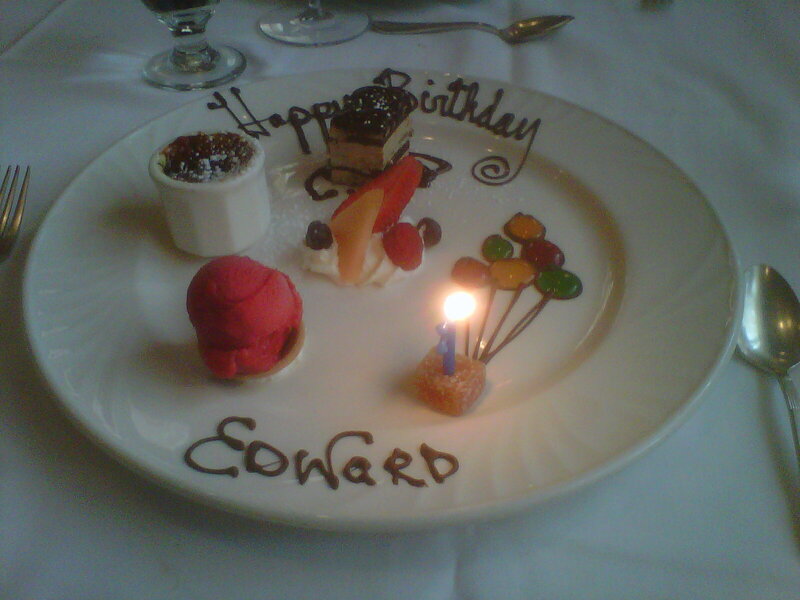 Since this was a birthday celebration of sorts, the chefs delivered me this outstanding dessert, which was preceeded by a delicious appetizer plate and entree featuring salmon and tuna. Creme brulee and sorbet highlight my birthday dessert. Who knows. Maybe some day I’ll work in a real restaurant; the kitchen is way out of my league, but I’ve been told by a friend who leases restaurants and retail that I have what it takes to be a maitre ‘d. Maybe I’ll start a culinary blog. A lot have already taken The Food Dude moniker, so I’ll have to drop the “dude” component. Finally, a lasting memory of our visit to Le Titi de Paris: Tasting just-made ice cream, literally seconds after it leaves the machine. A little bit of culinary heaven on earth. This entry was posted in Uncategorized and tagged cooking, French restaurants, public relations, restaurants. Bookmark the permalink.